For other uses, see Italian Navy (disambiguation). The Italian Navy (Italian: Marina Militare, lit. "Military Navy"; abbreviated as MM) is the Navy of the Italian Republic. It is one of the four branches of Italian Armed Forces and was formed in 1946 from what remained of the Regia Marina (Royal Navy) after World War II. As of August 2014, the Italian Navy had a strength of 30,923 active personnel with approximately 184 vessels in service, including minor auxiliary vessels. It is considered a multiregional and a blue-water navy. The Regia Marina was formed on March 17, 1861, after the proclamation of the Kingdom of Italy. The Italian Navy assumed its present name after the Italian monarchy was abolished following a popular referendum held on June 2, 1946. A ban on owning, building or experimenting with atomic weapons, self-propulsion projectiles or relative launchers, etc. A ban on owning Battleships, Aircraft carriers, Submarines and Amphibious Assault units. A ban on operating military installations on the islands of Pantelleria, Pianosa and on the archipelago of Pelagie Islands. 1 Sailing School ship: Cristoforo Colombo. Great changes in the international political situation, which were developing into the Cold War, convinced the United Kingdom and United States to discontinue the transfer of Italy's capital ships as war reparations. Some had already been dismantled in La Spezia between 1948 and 1955, including the flagship aircraft carrier Aquila. However, the Soviet Union demanded the surrender of the battleship Giulio Cesare and other naval units designated for transfer. The cruisers Attilio Regolo and Scipione Africano became the French Chateaurenault and Guichen, while Eugenio di Savoia became the Greek Helli. After break up and/or transfers, only a small part of the fleet remained to be recommissioned into the Marina. As Western attention turned to the Soviets and the Mediterranean Sea, Italian seas became one of the main sites of confrontation between the two superpowers, contributing to the re-emergence of Italy's naval importance thanks to her strategic geographical position. With the new elections in 1946, the Kingdom of Italy became a Republic, and the Regia Marina took the name of Marina Militare (Military Navy). As the Marshall Plan began to rebuild Italy and Europe was rapidly being divided into two geopolitically antagonistic blocs, Italy began talks with the United States to guarantee adequate security considerations. The US government in Washington wished to keep its own installations on the Italian Peninsula and relaxed the Treaty restrictions by including Italy in the Mutual Defense Assistance Programme (MDAP). On April 4, 1949, Italy joined the North Atlantic Treaty Organisation (NATO) and, in order for the navy to contribute actively in the organization, the Treaty restrictions were definitively repealed by the end of 1951, with the consent of all of Western nations. Within NATO, the Italian Navy was assigned combat control of the Adriatic Sea and Strait of Otranto, as well as the defence of the naval routes through the Tyrrhenian Sea. To ensure these tasks a "Studio sul potenziamento della Marina italiana in relazione al Patto Atlantico" (Study about the development of the Italian Navy with reference to the Atlantic Pact) was undertaken, which researched the structures and the methods for the development of the navy. 4th quarter: on red field, white Pisan cross (Republic of Pisa). The shield has a golden crown, that distinguishes military vessels from merchant: the crown, "corona rostrata", was proposed in 1939 by Admiral Domenico Cavagnari to the Government, as an acknowledgement of the Italian Navy's origin in Roman times. 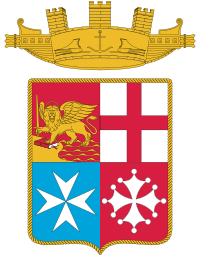 In the proposal, Adm. Cavagnari wrote that "in order to recall the common origin [of the Navy] from the Roman sailorship, the Insignia will be surmounted by the towered Crown with rostra, the emblem of honour and valour the Roman Senate awarded to the leaders of naval victories, conquerors of lands and cities across the seas". A further difference is that St. Mark's lion, symbolising the Republic of Venice, does not hold the gospel in its paw (as it does on the civil ensign, where the book is open at the words "Pax tibi Marce, evangelista meus", meaning "Peace to you Mark, my Evangelist") and is wielding a sword instead: such an image is consistent with the pictorial tradition from Venetian history, in which the book is shown open during peacetime and closed during wartime. Reporting to the Logistics Command is Maritime Command – divided into four areas who provide logistic support for their areas. Today's Italian Navy is a modern navy with ships of every type. The fleet is in continuous evolution, and as of today oceangoing fleet units include: 2 light aircraft carriers, 3 amphibious assault ships, 4 destroyers, 12 frigates and 8 attack submarines. Patrol and littoral warfare units include: 10 offshore patrol vessels and 1 corvettes. Ten mine countermeasure vessels, four coastal patrol boats, and a varied fleet of auxiliary ships are also in service. The flagship of the fleet is the carrier Cavour. The Italian Navy operates a diverse fleet of aircraft including fixed-wing, rotary and UAVs. 7 x PPA, Pattugliatore Polivalente d'Altura – Offshore Multipurpose Patrol Ship (with three more on option: for commissioning between 2021/2026: 5,800/6,280 t, 143 m, 1 x Oto Melara 127/64 mm Vulcano, 1 x Oto Melara 76/62 mm Strales, + 32 kn, 2 helos NH90/AW101). 7 are financed and 3 on option: 16 are planned in total. 2 additional (III Batch) U-212 updated Hunter-killer submarines (U212E) are financed with commissioning in 2025-2026, for about 1 Billion Euros (With option for 2 other ones, to maintaining the fleet to eight units). 1 x USSP "Unità Soccorso Sommergibili Polivalente" (Multipurpose submarine rescue vessel) to replace the submarine rescue ship Anteo: 131.5 m x 23 m, 10.500 tonnes, flight deck and hangar for 1 AW-101, ROV, AUV, UUV, hull for artic navigation, etc. 1 x UIOM "Unità Idro Oceanografica Maggiore (Ocean going Hydrographic vessel) to replace the hydrographic survey vessel Ammiraglio Magnaghi: 94 m x 16.6 m, 3,600 tonnes, flight deck and hangar. 8 x COV (Cacciamine Oceanici Veloci - FOMH Fast Oceanic Mine Hunter) to replace Lerici/Gaeta MHC class, since 20s half years: length about 76 m, displacement 1,300/1,400 t, speed about 25 kn, 2 x ROV, 2 x UUV, armed with OTO Melara 25/80 mm turret. 2 x DDG (Doria/Horizon class development), about 8,000/9,000 t, in a joint program with France. 1 The rank of "ammiraglio" (admiral) is assigned to the only naval officer promoted as chief of the defense staff. 2 The rank of "ammiraglio di squadra con incarichi speciali" (squadron admiral with special assignments) is assigned to the naval officer promoted as chief of the naval staff and/or as secretary of defense. 3 As Officer Designated, the rank of "aspirante guardiamarina" is comparable to the Royal Navy midshipman. ^ "LA MARINA MILITARE OGGI" (PDF). www.marina.difesa.it (in Italian). ^ Todd, Daniel; Lindberg, Michael (May 14, 1996). "Navies and Shipbuilding Industries: The Strained Symbiosis". Greenwood Publishing Group. Retrieved May 14, 2018 – via Google Books. ^ Till, Geoffrey (August 2, 2004). Seapower: A Guide for the Twenty-First Century. London: Routledge. pp. 113–120. ISBN 9781135756789. Retrieved December 15, 2015. ^ Coffey, Joseph I. (1989). The Atlantic Alliance and the Middle East. United States: University of Pittsburgh Press. p. 89. ISBN 9780822911548. Retrieved November 30, 2015. ^ a b "Organizzazione". Italian Navy. Retrieved September 1, 2016. ^ "Organization Chart of the Italian Navy" (PDF). Italian Navy. Retrieved August 15, 2016. ^ "Napoli, cambio al vertice del Comando Logistico della Marina". informazionimarittime.it. Retrieved May 14, 2018. ^ "Il Comandante - Marina Militare". marina.difesa.it. Retrieved May 14, 2018. ^ "Comandante del Comando Marittimo Sud - Marina Militare". marina.difesa.it. Retrieved May 14, 2018. ^ "Marina Militare, cambio al vertice Le foto". tarantobuonasera.it. Retrieved May 14, 2018. ^ "Cambio Comando supporto logistico Marina - Sardegna". ansa.it. July 29, 2016. Retrieved May 14, 2018. ^ "Ammiraglio Comandante - Marina Militare". marina.difesa.it. Retrieved May 14, 2018. ^ "Coast Guard – Port Authorities". Italian Navy. Retrieved September 6, 2016. ^ "The Present Aviation - Marina Militare". marina.difesa.it. Retrieved May 14, 2018. ^ "The Fleet - Marina Militare". marina.difesa.it. Retrieved May 14, 2018. ^ "European Multi Mission Frigates - Marina Militare". marina.difesa.it. Retrieved May 14, 2018. ^ "Naval Program 2014 - Marina Militare". marina.difesa.it. Retrieved May 14, 2018. ^ "Pinotti: «L'Italia avrà altri due sommergibili» - The Medi Telegraph". themeditelegraph.com. Retrieved May 14, 2018. ^ "Fincantieri - Logistic Support Ships". fincantieri.com. Retrieved May 14, 2018. ^ "Fincantieri - Hydrographic Survey Vessel". fincantieri.com. Retrieved May 14, 2018. Wikimedia Commons has media related to Marina Militare.